My fiance and I are both former bartenders. We often have "cocktail night" at home where we will try to outdo each other with a made up signature drink. We take our cocktails seriously and never agree as to who the winner is. With that said, until recently, you would never find a pre-made cocktail mixer in our house. 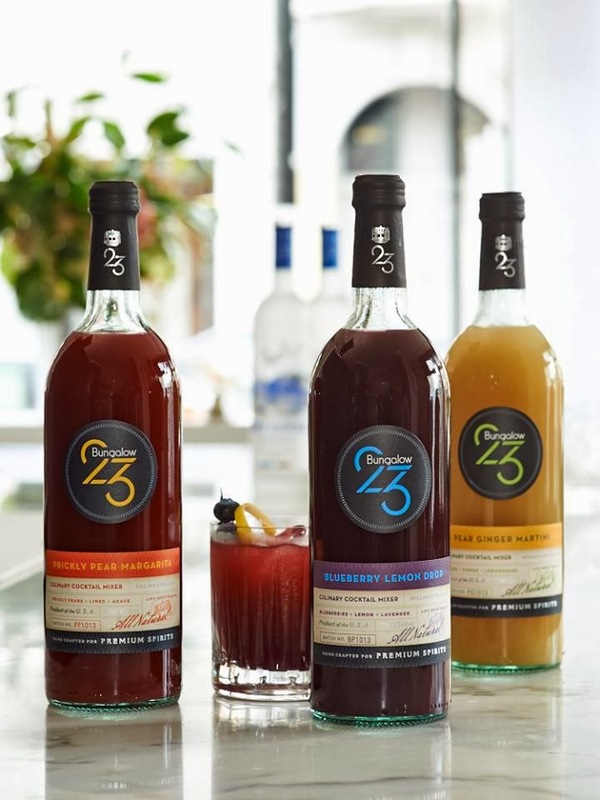 Rick Ferrone and Chris Henderson, two entrepreneurs out of Orlando, recently launched a line of craft cocktail mixers called Bungalow 23, "The cocktail mixer hand crafted for premium spirits". These mixers make it simple to enjoy a hand crafted cocktail at home. What sets these mixers apart from all the others is the word fresh. No concentrates and nothing artificial found here. Bungalow 23 is made from fresh fruit purees, real fruit juices, and homemade extracts using fresh cut herbs. Within weeks of it's product launch, Bungalow 23 hit the Central Florida market like a wildfire. Bungalow 23 is available to purchase at multiple bars, restaurants and retail locations. We had our first encounter with the product at our corporate holiday party last month. To say we were pleasantly surprised is putting it mildly. Bungalow 23 currently has three flavors on the market; Prickly Pear Margarita, Blueberry Lemon Drop and my personal favorite - Pear Ginger Martini. 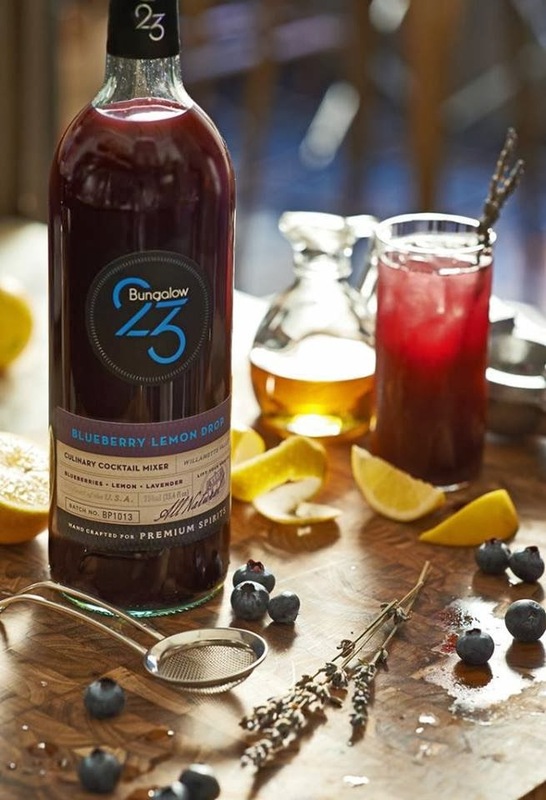 I brought a bottle of Bungalow 23 Blueberry Lemon Drop to my family Christmas Eve party this year. While I was happy to share with my relatives, this bottle went way too fast. This mixer makes an excellent martini (or shot) with a sugar rimmed glass. The Blueberry Lemon Drop mixer is made blueberries from Oregon's Willamette Valley, fresh lemons, lemongrass, lavender and pure cane sugar. Bungalow 23's Pear Ginger Martini uses the finest Washington's Wenatchee Valley Pears with a kick of spice offered up by fresh ginger, lemons and lemongrass. This is a perfect cocktail for those who prefer a little spice in their lives. It was no surprise to me that I loved this drink - as my favorite cocktail is a Moscow Mule. If you are a fellow Moscow Mule (or Dark and Stormy) fan, this mixer is for you. Now I bring you to my mothers favorite Bungalow 23 flavor, Prickly Pear Margarita. This mixer was created using Prickly Pears from California's Salinas Valley, fresh limes and oranges, blue agave nectar and a hint of cilantro. While visiting home for the holiday's, we made Prickly Pear Margaritas using my Blendtec blender. I am not a fan of frozen margaritas but this was unlike any other and we quickly went for refills. While we knew Prickly Pear was delicious with tequila, Mom decided to make it with pineapple rum. She stated it was her favorite drink ever and decided at that moment not to return the Bunglaow 23 Prickly Pear Margarita mixer to me. So how did Bungalow 23 come about? Rick Ferrone was ordering a cocktail at the bar when the idea came to him. Ferrone doesn't mind spending a few extra dollars for an expensive call brand of liquor. Yet the thought of putting sugary concentrated mixers in his cocktail made him realize there wasn't a fresh mixer out on the market. Nearly 100 taste testers put their thoughts on how to make the first stage of the mixres better. Ferrone and Henderson took their comments into account and tweaked their recipes until they were perfected – and they are just that – Perfect. Then it was time to distribute the first three flavors which are available in 750-ml bottles. One thing that I love about the labels on these bottles is that they provide tasting notes along with showcasing the region of each drink’s feature ingredient. I am giving away one set of Bungalow 23 Cocktail mixers to one lucky reader! Let me know in a comment below what flavor of Bungalow 23 you are most excited to try. Don't forget to submit your entries through the rafflecopter widget below. Forsure the blueberry lemon drop...these look fantastic... By the way...im sitting here trying to see if i want to try for the dumbo double thingy in california.... Yes...no...yes...no.. ? I know the registration opens in a couple hours! DO IT!!!!!! Girl, if I could this year, I would be signed up already with my Annual Pass early admission. We are getting married 3 weeks later and I cannot justify it with everything going on. My Mom would shoot me! I will live vicariously through you do it do it do it! I can't just pick one flavor that I want to try, I simply CANNOT. Really looking forward to trying these!!! That Prickly Pear sounds incredible! Blueberry lemon drop sounds yummy! They all sound great, but Pear Ginger Martini? I'd drink that! Mmm...they all sound delish, but I think I would like the Prickly Pear Margarita the best! Sounds so good. Blueberry Lemon Drop is making me salivate! The prickly pear margarita. There's a restaurant in Riverfront Fort Lauderdale that made the best ones. I haven't been able to find a substitute for them. So this would be perfect! Pear ginger would be the first I would try but they all sound great. I'd love to try the Pear Ginger.